I have watched and re-watched this movie, plus I have also re-read the manga [not the entire series, but to a certain point where you can make a fairly decent comparison of the two]. You don’t have to be a fan of the manga to enjoy this feel-good high school love story. That being said, while I did enjoy the movie, I did have some problems with the female lead’s acting. At times it was really great and at other times, her voice and actions… you could really tells she was acting. Kind of sad, but otherwise, she did a fairly good job. I do also have some problems with the reordering and restructuring of some of the manga’s plot. While the gist of the story is the same, there are things that I would have liked to have stayed a little more true to the manga. That being said, it is rather hard to do a manga justice in a 1 1/2 – 2 hour movie. For those unfamiliar with the plot of the manga, the basic story is that of a girl named Haruna who gave her all to playing softball in middle school and who decided to pursue love in high school. When things don’t go well, as she manages to repel rather than attract guys with her intensity, she approaches the popular, cold Yoh for love and popularity coaching. He’s reluctant at first since a past experience has made him mistrust girl, but he eventually caves to Haruna and begins to instruct her. The movie opens with Haruna [Ono Ito] telling her story about how she devoted her life to softball in middle school and decided to devote herself to love in high school However, after a year, she was still unsuccessful. She dresses up [way over the top] and waits at a statue in town to be hit on with no success. When a guy approaches for a survey, her fighting spirit chases him off. She runs after him, but ends up tripping and losing her shoe. It is returned to her by a tall, good-looking young man wearing mostly black [Mizobata Junpei]. His friend [Suda Masaki] tells Haruna that Yoh said her shoe was ugly, so she’d better get rid of it. Haruna thanks Yoh for her shoe and takes off running. Why? The next day Haruna complains to her best friend Mami [Miyazawa Sae] about failing yet again. Mami wonders if Haruna has any idea why she keeps failing, but Haruna is clueless. Mami then instructs Haruna to get a coach. This makes sense to Haruna who used to play softball. She asks Mami, but her friend refuses as Mami doesn’t understand how guys think either. Is there no one else Haruna can think of? Haruna then recalls the good looking boy from the previous day. It seems like he would know what she should do, but she has no idea who he is. She might never see him again. But just then he goes walking by her classroom. Thus Haruna heads after him on a mission. She bowls into people, but keeps on chasing. When Yoh gets to the stairs ahead of her, Haruna jumps down them afraid of losing him. This shocks Yoh. Haruna introduces herself and then begs Yoh to be her coach. Unfortunately, he refuses. It’s too troublesome as girls decide themselves what they like and don’t. Next to Yoh was his little sister Asami [Aizawa Rina] who thinks it would be fun if Yoh coached Haruna. After seeing Haruna pitching in gym, Asami invites the other girl over to borrow clothes that she wore when she got hit on. Now, how the petite and tiny Asami’s clothes would ever work on the taller, more solid Haruna is beyond imaginable. Yoh comes downstairs and sees Haruna trying on Asami’s clothes. Haruna stares at him silently begging him to be her coach, but Yoh refuses once more. Eh, how did he know what she was thinking? It was kind of obvious. Yoh, who loves takayoki [in the manga Haruna opened a jar for him that he couldn’t open], caves and completely dissembles Haruna’s outfit, telling her why it doesn’t work for her when it worked for Asami. Haruna thanks him for his advice. Yoh does warn her that love isn’t all sunshine and roses and walks away. Haruna chases after him and says that she knows there is pain and tears involved, too, but she still wants to experience love. That night Asami watches the video of Haruna when her middle school won the final tournament [in the manga, her team actually lost in the finals]. Yoh, seeing Haruna’s crying and passion, is touched. The next day Haruna again fails at attracting guys. When she wonders just what she’s doing wrong, Yoh comes and starts telling her what’s going on: too much perfume, hat trying too hard, too many accessories, etc. Yoh also warns her that she is too unapproachable with the energy she gives off. No kidding, the girl is way too intense. He then says that he will coach her as long as she promises to absolutely never fall in love with him. Haruna quickly agrees to this. Yoh sits Haruna down afterschool to discuss her many failures. Haruna opens up her notebook to take notes. As Yoh essentially points out all of her problems, Haruna is stunned. She turns the pages to her notebook and talks about how that is not what she learned. Yoh looks at her research and tosses it in the trash. Following all those articles is part of her problem. Yoh then decides to take her out shopping for a skirt. 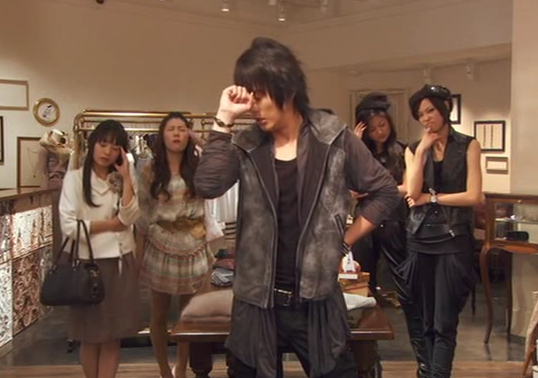 Haruna is shocked to see Yoh immediately surrounded by girls in the store. The boy is even more popular than she thought. Yoh picks out skirts, but none seem to suit Haruna at all, making the day a failure. Haruna feels bad and thinks she should do a gag to lighten the mood. Yoh tells her that is unnecessary, shocking her. How did he know? Well, Haruna is horribly transparent [at least to Yoh]. He then asks her what she was going to do and she when she does an impersonation [that I don’t get] Yoh’s reaction is to get up and leave. Haruna apologizes and follows after. They go back to Yoh’s house where he believes that it’s male clothing that suits Haruna the best. He goes through his closet and has her try on a shirt and jeans. When she finishes, he says that does suit her very well after all. This makes Haruna happy, but Yoh insists that she shouldn’t be happy. True, she looks good, but no guy will want her in those clothes. Yoh refuses to give up. He will find feminine clothes that suit Haruna. It’s at this time that Asami, Fumiya, and Asaoko [Furukawa Yuki – LOVED him in Asuko March!] come in. They heard from Asami that Yoh was coaching and wanted to see for themselves. The boys’ flattery shocks and touches Haruna until Yoh say that is just how they are and not to take them seriously, depressing the naïve girl. The gang then all sit down and eat dinner together and at the mention of “beads” Yoh gets angry and goes to his room to sketch clothes for Haruna. Asaoko then reminds Fumiya that “beads” is taboo. Asami then explains what happened [this differs quite a bit from the manga actually]. Yoh dated one of the managers of the basketball club in middle school. When the other manager who liked Yoh lied to his girlfriend saying she was dating him as well, Yoh’s girlfriend broke up with him, but not before ruining his entire relationship with the basketball team. She made him a bead bracelet [hence why beads is taboo]. This is why Yoh doesn’t trust girls. In the manga, it was his straightforwardness that got him in trouble, not another girl pretending to be his girlfriend. In the manga, his girlfriend really liked beaded jewelry, but Yoh wasn’t all that interested in it, thus causing a misunderstanding that hurt his girlfriend’s feelings and estranged him from the rest of the team. When Yoh comes back, he wonders what’s with the atmosphere. Haruna starts crying and tells him she will do her best. Poor Yoh has no idea what to say to that. The next lesson is a practical date. Yoh calls Fumiya to take Haruna to the beach. Haruna is so freaked out, she doesn’t know what to do. Fumiya immediately agrees and Haruna talks very robotically when Yoh gives her the phone [she ends up repeating everything after him since she doesn’t know what she’s doing]. The dates is set for Sunday. Haruna immediately asks Yoh to go with her as she can’t do it alone. Yoh initially refuses, but does eventually agree. When Asami wishes to tag along, Yoh vetoes this upsetting his little sister. In the manga, Haruna went to the batting cages where she ran into Fumiya and the two hit if off, both kind of crushing on each other. Yoh set up a date between them to ascertain if their feelings were real and then encouraged Haruna to confess. Not the case here, it’s just a practical lesson. The next day comes and Yoh holds Haruna back as she immediately wants to rush over to Fumiya. Yoh says that its okay if girls make guys wait a bit. Haruna can’t take it anymore and brushes past Yoh [who’s wearing glasses as a disguise] to run up and apologize to Fumiya. Now what follows is Haruna doing her best and having fun while Yoh watches on and texts her on how to properly behave on her date. [In the manga, it is actually after Yoh and Haruna start dating that this beach scene happens with him and her on their first official date]. When Haruna asks Fumiya what kind of girl he likes, she is immediately shocked when Fumiya declares its someone like her. At first Haruna thinks he’s kidding, but Fumiya insists that he is being serious. He likes honest girls like Haruna [plus her ways seem to amuse him in a good way]. Haruna immediately says that she likes guys like Fumiya as well and gets a text from Yoh telling her not to take the confession too seriously. Haruna shuts her phone, ignoring his text. Yoh then gets angry and emails her that he’s leaving and takes off since she isn’t listening to him. The date ends and the two separate. Fumiya goes to tell Yoh how the date went and learns from Asami that Yoh was out. Fumiya talks about how fun it was and Asami pouts about how bored and lonesome she was. Fumiya promises to take her next time as Haruna wouldn’t mind and gets the shock of his life when Asami climbs onto his lap. Haruna finally sees Yoh’s last mail and immediately rushes off to his house to apologize. She walks in on Asami kissing Fumiya. Haruna immediately rushes out and runs past Yoh who wonders what is going on. When he gets in the house and Fumiya announces that he and Asami are dating now, Yoh runs after Haruna. He finds her crying in the park. He asks if she was falling for Fumiya. Haruna doesn’t know. Yoh then promises that he will find her an even better guy and Haruna gives a fighting yell saying she won’t give up. [We then skip the drama behind Asami and Fumiya hooking up that was in the manga – can’t say that I missed it, but it might’ve explained Asami’s actions and sudden attitude change in this scene]. At school, Haruna pays close attention to the lovey-dovey new couple in order to get more information on how a girl should behave. Asami then decides that Yoh and Haruna should join her and Fumiya on a double date. They quartet go to an aquarium. Haruna closely observes Asami and tries out all her moves. but they all end in failure. Asami and Fumiya go off on their own for some privacy and Haruna and Yoh go back home [again, I want to say this happened after they started dating in the manga, but am not 100% certain, but I do remember Yoh telling the other two that he wanted to be alone with Haruna]. Haruna doesn’t get that the couple wants alone time and just thinks they don’t like dolphins. After the aquarium, Yoh and Haruna run into kohais from Haruna’s middle school. Yoh tells her that it is okay to go play with the girls. Haruna promises to only do one pitch, but ends up staying and coaching the girls. As she says goodbye to the girls, she realizes that she left poor Yoh all by himself for awhile. She immediately apologizes and Yoh tells her there’s no need. He also tells her that she doesn’t need to try so hard. There is sure to be a guy who can like the kind of girl she is. This really touches Haruna and she asks him to repeat it one more time, but Yoh refuses [in the manga, this was after they were already dating, too, not before, though the order doesn’t necessarily matter]. That night is where Haruna really starts falling for Yoh, not that she herself has totally realized it yet. Now we have the bullying starting. Haruna is oblivious to it at first and Asami and Mami point it out. In the manga, Haruna did become a bit bothered, but put on a brave face for Yoh [she also had a major fight with a group of girls which wasn’t showcased in the movie, but I would have liked to see that scene]. A trick is then played and Haruna and Yoh end up locked in the gym storage closet. It’s really cold and Yoh is already sick. Haruna does whatever she can to think of escape and keeping him warm. She finds one blanket and they end up sharing it. Eventually, Haruna’s fighting spirit burns full strength and she decides to start ramming the door to save Yoh. Of course, Haruna’s desire to protect him, touches the sick boy, but he can’t let her do it alone. As they both run at the door it suddenly opens and the two fall flat on their faces. I really loved this scene as it was so cute when Yoh invites Haruna in, but she just can’t seem to make herself join him inside the blanket, so he pulls her to him. Outside the door the gang has gathered. Mami saw Haruna’s bag was still in the classroom and she called Asami who hadn’t heard from either Haruna or Yoh. Thus the gang got together to find the two. A light bulb goes off [again we deviate quite a bit from the manga here, but that’s okay – condensing is better in this case] for Haruna. She finally recognizes the girl behind a lot of the more violent bullying. She runs out and confronts the girl who was a middle school rival in softball. The girl was from the opposing team that Haruna struck out at the end to win the finals. Matsuzaka asks for a rematch and tells Haruna that she must break up with Yoh [even though Haruna has told her they are not dating] and Haruna makes Matsuzaka agree to leave Yoh alone if she wins. Haruna pitches and although Matsuzaka makes contact, the bat shatters. Thus Haruna is the winner. Matsuzaka cannot believe this. Haruna tells her to find love and walks away to where her friends have gathered. Haruna and Yoh walk home together after this. Yoh notices that Christmas is approaching and Haruna is still single. They will have to up the game. Haruna tells him only after he has recovered. The two go their separate ways, but Yoh calls back and thanks Haruna for protecting him and he smiles at her. This hits Haruna like a ton of bricks. Oh no! She has fallen for Yoh! The problem is, how to keep it a secret when Yoh is pretty good at reading her? Haruna doesn’t want to lose Yoh, so she wishes to keep it a secret since Yoh made her promise not to fall for him. This of course starts her acting weird with Yoh and running away from him. I loved it when Haruna kept trying to focus on meat buns to throw Yoh off. The two then go guy watching to find Haruna a prospective boyfriend. Haruna rejects every guy that Yoh points out. This really makes things difficult. Why won’t Haruna choose? Asaoka comes and says that’s because Haruna must have someone she likes but she can’t be with [Yoh is soooo dense here]. Haruna denies having someone she likes, but Yoh, like an idiot, believes that she might have some feelings for Asaoka this time [he does misunderstand this in the manga, too]. Later, Haruna sits miserably next to another girl. Christmas is almost there and Kurihara Makota [Okamoto Rei] can only think about her ex that she broke up with. She tries to call or text and he won’t reply, but she wants to see him again. Haruna replies that she has fallen for someone she shouldn’t have fallen for. Haruna then agrees to help support Makota in trying to reconnect with her ex. Haruna is really conflicted. Should she confess and risk Yoh hating her or should she keep quiet to remain by his side? To clear her head she goes to the park to do side jump things. Yoh finds her and wonders what she is doing out that late at night. Haruna tells him she’s trying to clear her head and Yoh escorts the girl home. When Haruna screws up her courage to confess, Yoh then asks what she thinks about dating Asaoka. This upsets Haruna and she fires Yoh as her coach before storming off, leaving Yoh completely confused. In the manga, he was confused about this as well. Haruna had actually invited him on a date and wanted to confess. She had even gone shopping with Asaoka to pick out a present he would like. I think I would kind’ve liked to see that, but this wasn’t a bad way to do it. To make matters worse, Haruna learns that Makoto is Yoh’s ex! Makko-chan even asks Haruna to deliver a letter to Yoh after Asami chases her out. Since I haven’t actually read the manga all the way through, I have no idea if Yoh’s ex rears her head again or not. Though given manga and drama plots, it wouldn’t be too surprising if she did. These incidents put both Yoh and Haruna in bad moods which their friends notice. Asaoka decides that its time that he steps in and bring the two together. He invites Haruna out on a date. The entire day Haruna only thinks about Yoh. Therefore she is shocked when Asaoka confesses and tries to kiss her. At that moment, Yoh comes in and saves the day. Asaoka walks off telling Haruna it’s all a joke and that he is too nice of a guy. Yoh then invites Haruna out on Christmas as he has something left to teach her. The idiot has no idea that Yoh already reciprocates her feelings – that’s why he followed her and Asaoka. Yoh and Haruna have fun Christmas date, but Haruna can’t get Makko-chan out of her head. She does decide to give Yoh the letter and begs him to meet her [after Haruna confesses that she likes Yoh]. Haruna doesn’t want Yoh to regret anything. Yoh does end up leaving and Haruna wallows in misery imagining the worst possible scenario [he hooking back up with Makko-chan]. Haruna realizes she cannot let that happen and rushes off to find him only to fall and have her shoe go flying. Yoh then comes and we end like we began with these two. He gives her back her shoe and says he talked to Makoto. He then confesses that he likes Haruna, too! Yay for them finally figuring it all out. And the best part is that they love each other for who they are. Haruna likes Yoh despite his harsh words and he likes her despite her being a clueless tomboy. Overall, this was an enjoyable movie and the manga deviations weren’t overly annoying. Although, I really did enjoy the manga where Haruna did her best to make it the best Christmas she and her boyfriend Yoh had, but still. Mizabota did a pretty great job acting the aloof, cold Yoh. I think this Yoh was a little bit more mature and knowledgable about love that the Yoh in the manga, but that’s okay. Love him, love this movie, and am happy to have discovered Ono Ito who is a fairly decent young actress. I can’t wait to see how much she grows as she did an admirable job with Haruna [although some things did seem over the top]. I won’t lie, I really wanted more of Asaoka. I really am getting attached to that actor. I can’t wait to see him do more in the future, maybe as a lead eventually. I was excited, too & pleasantly surprised by how well it followed the manga. Funny how I recently watched this but completely forgot about it. Not that it was a bad movie, but I guess I didn’t find it very original after having seen so many manga-based movies and dramas. Cute movie, yet maybe not my taste anymore. I really think that any movie based on a manga series won’t be as substantial as it could be. Heck, even dramas based on manga leave a lot out and unexplained [or completely change things]. I was a bit disappointed that Yoh’s sister’s development was left out and we didn’t get to see the two develop as a couple who both new nothing really about love and dating. It was cute in the manga how clueless Yoh really was [and yet he was Haruna’s coach]. In the ranking of guys in manga, Yoh rates pretty high up there on my list. And yet I still enjoyed the movie…maybe because Mizobata was playing Yoh… he wasn’t quite the epitome of the character, but he did a pretty darn good job in bringing him to life. the actor who plays Asaoka, is in Itazura na kiss~Love in Tokyo, a drama that is currently airing now!! to continue my last comment. YOU SHOULD REALLY WATCH IT!!! Love the actor who plays Asaoka. I’ve been hearing good things about the Itzura na Kiss reboot, but haven’t found the time to sit down and watch it yet.